Four out of five health problems in layer flocks in France are related to Escherichia coli, according to Jocelyn Marguerie, DVM. “Excluding digestive diseases, E. coli is always the first enemy in poultry,” says Marguerie, a poultry veterinarian with Cristal Group, which comprises 22 practices all over France. 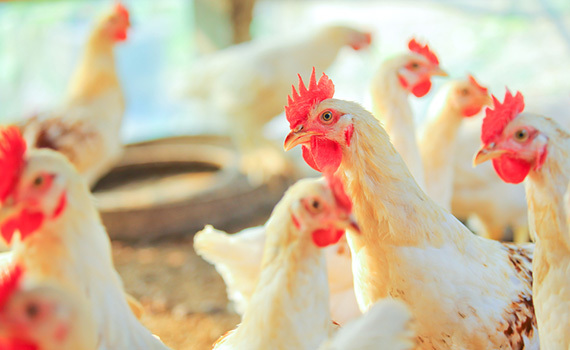 Found almost everywhere, E. coli are opportunistic bacteria in poultry, often involved in secondary infections following other diseases, such as infectious bronchitis, or after management problems in the poultry house, he explains. Affecting chickens of all ages and turkeys, E. coli infections usually lead to increased mortality. In laying hens, lesions may be seen in the pericardium (the membrane surrounding the heart), and the air sacs become inflamed. In egg-laying flocks, significant financial losses can arise from the elevated mortality rate and sometimes also from a drop in egg production. In Marguerie’s view, the prevalence of E. coli is not on the rise in poultry in France, but the disease is becoming harder to control. Pressure to reduce the use of antibiotics in veterinary medicine has exacerbated the problem. Egg producers switched to the larger, enriched (or colony) cages, aviaries or free-range systems, which are more challenging to manage well. Enriched cages hold many more birds than the conventional batteries, he explains, making it harder to inspect each individual bird. These difficulties are multiplied with a flock of 30,000 hens that can move freely around an entire aviary building, let alone one with access to a free-range area. There are few options available for the control of an E. coli infection in a flock during the laying period, according to Marguerie. There is a limited choice of antibiotics that are authorized for use during lay that have a zero withdrawal period for eggs. Among those options is colistin, but it is only partially effective and is likely to be reserved for human use in the near future. Around 10 to 15 years ago, colleagues at a Cristal practice used an autogenous vaccine to immunize a laying flock with a serious E. coli problem, Marguerie explains. The vaccination was successful in reducing bird mortality, but it was certainly no quick fix. It took 5 weeks to match the field strain and produce the vaccine. Each bird also had to be handled and injected individually, so it was labor-intensive and costly to use. About 18 months ago, a farmer with an aviary-housed flock of 30,000 birds contacted Marguerie to report that hen mortality was up by a factor of three — and it seemed to be rising. Weekly losses had already reached around 0.0015%, which compares with the previous normal rate of around 0.0005% per week. The good news was that egg production from the rest of the flock was hardly affected. Still, the producer was understandably concerned about the rise in mortality and its longer term implications. Marguerie immediately suspected E. coli. Visiting the farm, he found the birds to be showing no obvious disease symptoms, and he ruled out the possibility of flock-management problems, such as drinking-water quality, litter management or causes of stress. Post-mortem examination revealed typical lesions for E. coli infection, and bacteriological testing confirmed the presence of a pathogenic E.coli strain. Seeking an urgent solution, Marguerie recalled the previous successful experience with vaccination. The difference now is there is a commercial, modified-live vaccine available (Poulvac® E. Coli), which is approved for use in broiler chickens and future layer/breeders in order to reduce mortality and lesions (pericarditis, perihepatitis, airsacculitis) associated with E. coli serotype O78. According to Marguerie, vaccinated flocks have shown marked declines in mortality on farms where the bacterial pathogen has been identified. Based on this positive experience, Marguerie has recommended the vaccine to other clients whose laying flocks have confirmed E. coli infections. The vaccine has been successful in other aviaries, and floor and free-range systems. The cost of the vaccine is negligible in comparison to the loss of production and mortality arising from an outbreak of E. coli, he says. Poulvac® E. Coli on day 1, followed by a booster at around 14 weeks of age. “Our target is to get the E. coli vaccine included for pullets as part of each layer flock’s disease-prevention program,” Marguerie says. “E. coli is a common problem in breeder flocks, too, and vaccination has become a common practice for that sector now.